What are the key communications and outreach challenges for multi-chapter organizations? We all know that communications are critical to any relationship. And our recent Multi-Chapter Benchmarking Survey findings suggest that multi-chapter relationships are no exception. Survey respondents identified communications – both with members and their Central Organization (or HQ) – was one of the key challenges their organizations face. While communicating with members is always the top priority for any membership organization, we recognize that those with multiple chapters have additional layers or levels of relationships to manage and maintain. While our full Multi-Chapter Benchmarking Survey Report (available at the end of this month) offers detailed insight, we thought we’d share some of the highlights of our findings on multi-chapter communications and website administration in this post and through our new infographic (click image to enlarge). 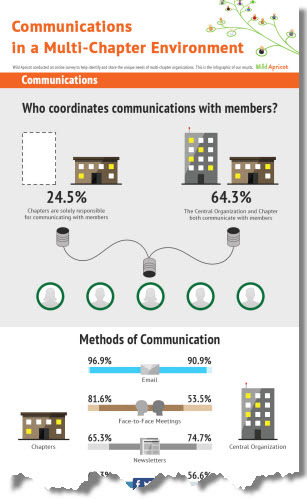 Our survey data indicates that more than 60% (64.3%) of respondents reported that their chapters work together with the central organization to communicate with members, with slightly less than a quarter (24.5%) of participants reporting that chapters are solely responsible for communications. With the shared communications roles across chapters and HQ, we wondered who was responsible for which member communications and what methods were used. 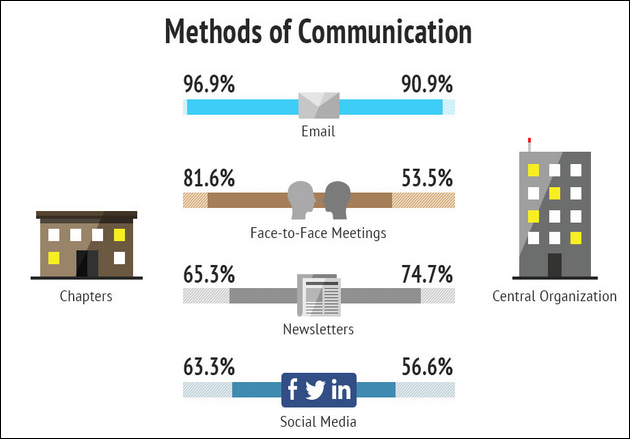 This visual from our infographic illustrates the top four communications methods. You'll note that email is the top communications channel for both chapters and central organizations. However, the chapter understandably plays the key role in terms of face-to-face meetings (81.6%). Both organizations offer newsletters and are involved with managing social media. On the flip-side of the chapter-central organization relationship, it was also interesting to note that when we asked what additional resources they’d like to receive from their HQ, chapter respondents noted they’d like to see central organizations providing website templates, design standards and technical support to chapters. Who manages chapter website content? More than 80% of respondents noted that chapters manage their own web content; while fewer than 10% of sites are managed by the central organization. Want more details on our Multi-Chapter Benchmarking Survey? This was just a snapshot of the insight we’ve gathered about communications and website management at multi-chapter organizations. If you’d like more detailed survey findings on these and other topics, you can register to receive the full survey report (available at the end of September) here: https://www.wildapricot.com/multichapter-benchmarking-survey. Why when I enter my information to register for the report does it say that I will receive it in January 2013? Larry: Thanks so much for pointing that out. That is an error - we'll be sending out the Multi-Chapter Benchmarking Survey Reports at the end of September.